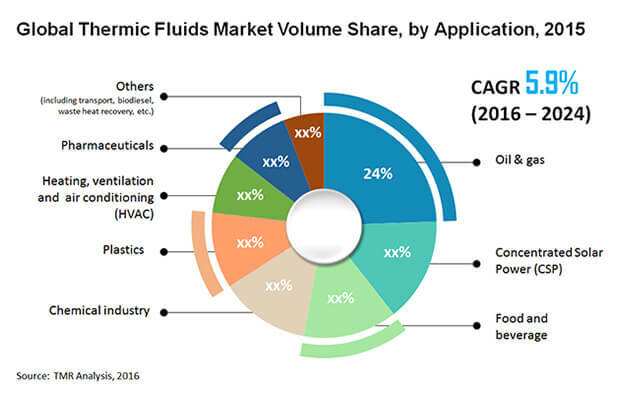 The global thermic fluids market displays a scenario of cut-throat competition and high level of consolidation. Only a handful of market players have had proven success in the market and these market players are expected to keep dominating the competitive landscape over the coming years. The top four market players collectively held 71% of the total market share in 2014, which reflects the strongholds of these players. Furthermore, these top market players are expected to constantly invent new business strategies to ensure that their dominance remains unchallenged. Owing to the high level of consolidation, the entry of new market players is shielded and the established market players compete amongst themselves. In order to expand their geographical reach, the market players are anticipated to penetrate the local markets of developing countries. Moreover, mergers and acquisitions are also prognosticated to be a key strategy of the market players aiming to enhance their growth prospects. Dow Chemicals has emerged as the supreme leader of the global market for thermic fluids and the company held the highest market share in 2014. The thoughts leadership of the Dow Chemicals, strong grounding in the manufacture of thermic fluids, and innovative business strategies adopted by Dow Chemicals are behind its tremendous success. British Petroleum (BP), BASF SE, Exxon Mobil Corporation, and Royal Dutch Shell are amongst key companies in the global market for thermic fluids. Transparency Market Research (TMR) predicts that the global market for thermic fluids would expand at a robust rate of 7.10% over the period between 2015 and 2024. The market was valued at US$2.1 bn in 2014 and is projected to escalate to a value of US$4.17 bn by the end of 2024. The oil and gas industry is a giant part of a region’s economy and several operations run together in the industry. In recent times, there have been a series of developments in the oil and gas industry of several regions. Hence, the use of thermic fluids in the oil and gas industry has given a boost the demand within the global market for thermic fluids. Furthermore, the oil and gas industry encapsulates a range of intricate operations and processes wherein thermic fluids are used, which is why there is regular inflow of demand within the global market. Besides this, thermic fluids are also used in the chemicals industries for a wide range of applications. Hence, the demand within the global market for thermic fluids is projected to take positive leaps at all times. Renewable ways of producing energy have become the top-most concern of several government bodies and organizations in Europe. The government aims to increase the share of renewable energy in its total energy mix, which has propelled demand for thermic fluids in Europe. Greece, Portugal, Ireland, and Poland are amongst the leading countries in the market for thermic fluids. A substantial number of CSP plants have surfaced across Europe, which is another factor that is increasing the demand within the global market for thermic fluids. The review is based on a report by TMR titled “Thermic Fluids Market - Global Industry Analysis, Size, Share, Growth, Trends, and Forecast 2016 – 2024”.